Alongside the video footage of the Mosque attack of 15 March, a publication reportedly written by the terrorist behind the fatal attacks in Ōtautahi Christchurch, has been officially classified as objectionable. Those individuals must apply for an exemption to allow them to legitimately access and hold a copy of this document. Information on applying for an exemption can be found here. For the University, objectionable material is covered under both the IT Policy Framework. This policy binds both staff and students. · You may not break (or assist another to break) the law, for example, copyright violations, or viewing or holding objectionable material. If you have a copy of this publication that you are not legally entitled to possess, please delete or destroy it. If you see it, report it. If you see material of this nature online, report it immediately. From 9.30pm Friday 12 April until 5pm Sunday 14 April, a data storage migration will take place. During this time you will not be able to log onto the UC network. The current data storage infrastructure is outdated and has almost reached the limit of its capacity. Demand for data storage capacity has increased approximately 30% annually in the last five years. Improved performance, reliability and larger storage allowance of our network for both students and staff. The system will look the same as before. Services such as the Library, RecCentre and Security will continue to operate as usual. Students will be able to use LEARN, Office 365, OneDrive, email and UCGo from personal devices over the weekend. Please log off and power down your UC PC desktop or laptop by 9.30pm on Friday 12 April and do not log on or power up your UC PC desktop or laptop until 6am Monday 15 April. Please share this message with your team as soon as possible. Information on this outage will also be included in UC’s staff newsletter (Intercom) and student newsletter (Insider’s Guide). There will also be an all staff and all student email sent week commencing 8 April. For more information see the Q&A sheet here>. For technical questions please email Vincent Jordan. On behalf of the Emerging Leaders Development Programme (ELDP), I would like to provide some thoughts in the light of Friday’s events. This event was designed to cause fear and a sense of hopelessness. Instead, we have seen acts by individuals, groups, communities and organisations, using what they have, to provide comfort, support and help to our Muslim Community. It’s times like these that I am proud to be surrounded by such willingness to rise to compassion, kindness and to generosity, Not only in Ōtautahi Christchurch, but across Aotearoa New Zealand, around the word and, within our UC community. Where many of us could have sat back overwhelmed by it all, we have instead seen the greatness of humanity within our community. We have seen the Student Volunteer Army’s ethos and activation come to the forefront. Volunteers standing on the corners of our streets which made us feel safe and welcomed, and transportation provided for those who do not feel comfortable going alone. We saw our UC community band together to support each other whilst coming to terms with the events of Friday 15March. We saw our Muslim Students’ Association supporting the whole community, providing words of comfort, words of peace, words which also held immense grief. We saw our UCSA President address each individual student and staff with words that brought comfort, but also challenged. Here at UC we have seen students reflecting on what they can give. ELDP students Max and Louie and their fellow Rochester & Rutherford residents Harry and Oliver were inspired by this this willingness to rise above hatred and portray love. The four created a fundraising t-shirt that went on sale last week. 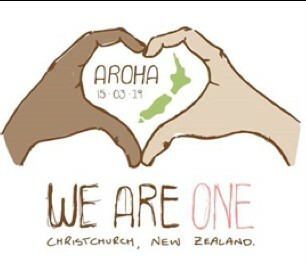 All proceeds from the purchase of the ‘‘We are one’ t-shirts go directly to St John Emergency Services. This is just one of the many initiatives we have seen over recent days. The love, compassion and courage shown by our Prime Minister and how she has stood with those who have been affected, has challenged us to express support, empathy and strength. Ultimately showing us what the role of a true leader is. Such leadership in the wake of the events of 15 March have spurred a lot of conversation around bystander intervention and how important it is for people to speak up when they see or hear something wrong. These conversations are necessary to shift prejudice attitudes, beliefs and to ensure the inclusiveness of everyone on our campus and city. Last week an ELDP student was telling me how she had been finding her first year at UC. She spoke of the aroha, inclusiveness and warmth that she felt here. She was then enabled to go on air, educate them on the proper terminology, and to make a stance. “Offensive comments have never been okay, and will never be okay,” she explained. This is an example to all of us, of the capability we have to speak up when we hear something that is not right. Therefore, my challenge to you is to be the person that speaks out. Be the person that advocates for inclusiveness, kindness, and compassion in a world that sometimes feels the opposite. I think the message I take away from this quote is, that your words and actions can either destroy or bring life, so choose life. Your words can either bring darkness or provide light, so choose light. Your words can either bring hate or show love, so chose love.